In my opinion, you must have some kind of exposure to financial services in your long-term diversified portfolio. You should have a heavy dose of securities in your portfolio that have some kind of intrinsic relationship to the human experience. Financial services are exactly one such sector, but admittedly that is only a recent development. Up until 15 or 20 years ago, your choices to be invested in financial services were relatively limited. There were banks, regional banks, insurance companies, credit card companies and consumer loan companies. With the rise of fintech, and the ability of technology to handle zillions of transactions at any given moment, owning financial services securities has become easier and more necessary than ever. This is one of the reasons I would take a close look at BlackRock, Inc. (NYSE:BLK) — the firm has its hands in all kinds of financial services spread across institutional, intermediary and individual investors, encompassing corporate, union, public and industry pension plans; insurance companies; endowments; mutual funds; governments; foundation; charities; sovereign wealth funds; and the list goes on. BLK stock also has operations in global risk management, manages portfolios of all types and styles, as well as mutual funds, unit trust and alternative investment vehicles. It launches and manages hedge funds. It invests in an entire range of stocks, bonds and every other security under the sun. It is truly a global player. And you certainly know it from its massive selection of ETFs , which trade under the name iShares. ETFs have certainly benefited BLK stock. I will say, however, that this could blow up in its face at some point. ETFs are really nothing more than derivatives, and because many of them are passive, should there be some kind of global selloff, ETFs themselves dropping shares could result in a vicious and destructive cycle of selling. This is also of concern because the majority of the BLK stock revenues come from fees for managing these passive funds. Things have been great the past 10 years, ever since the market bottom from the financial crisis. But we are now in a market that is significantly overvalued, trading at its third most expensive in history, and a significant correction is in the cards. The larger that correction is, the more likely people are going to be scared off from investing. If there is some kind of monster selloff and it traces back to ETFs , BlackRock stock is going to be facing a revenue problem in the future. The question is, as far as financial services go, whether BLK stock is right for your portfolio. At present, it is trading at the upper end of its valuation range — more than 21 times earnings. Its low end is 16 times earnings. Were the market, and the stock, not significantly strained right now in terms of valuation, I think owning BLK stock would be a good move. Certainly, if you have a very long-term time horizon of 10 years or more, there is reason to buy as long as you’re aware of the risks involved. However, in the aggregate, I think the stock is expensive right now. I have concerns about how ETFs may get blamed if we have a major selloff as well. I would wait until the big correction comes and then perhaps have a look at be okay stuck then. 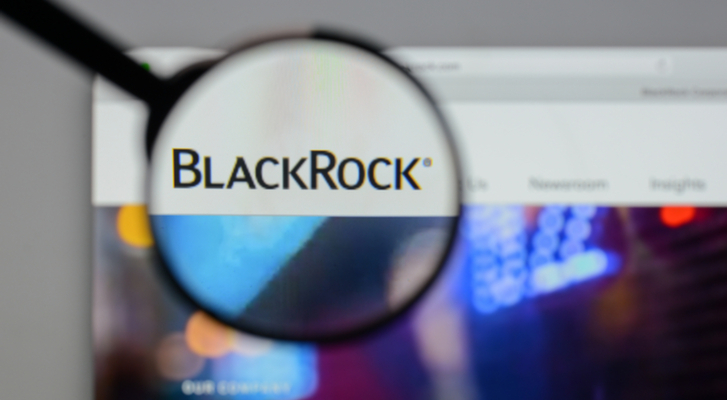 Article printed from InvestorPlace Media, https://investorplace.com/2018/04/blk-stock-the-investment-manager-wonder/.